The Battle of Hiekka (Pälkjärvi) took place on August 9, 1808, during the Russian-Swedish war of 1808-1809. The opposing sides were the Swedish-Finnish force numbering 250 regular soldiers and 400 voluntary peasant fighters under the command of Major Carl Wilhelm Malm and Russian force numbering 1 300 troops under the command of Major-General Ilya Ivanovich Alexeev. Major Malm successfully flanked Russian forces, which barely escaped and retreated as far as Sortavala. The Swedish-Finnish lost Second Lieutenant Löthman, 20 soldiers and 8 voluntary peasant fighters. The Russian losses were up to 200 killed and 30 captured. 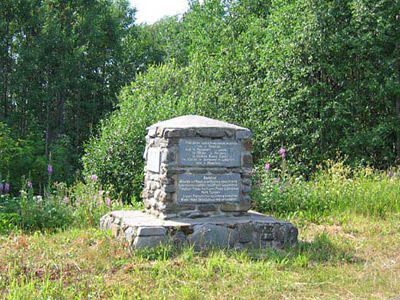 In 1928 the Pälkjärvi branch of Suojeluskunta (Finnish army assisting organization) erected a monument in the place of battle. In Memory of Pälkjärvi jäger company. 10/9 Ylistaro, 14/9 Oravainen, 20/9 Långfors. Farm labourer Mikko Jonasson and one unknown. The monument has been destroyed at the Soviet times. In 1992 the ruins of the monument was found on the shore of Pälkjärvi Lake during the reconstruction of the Värtsilä–Ruskeala road. In September 1994 monument was rebuilt by Pälkjärvi Society near of its former location. The monument is almost completely analogous to the original, but slightly shorter in height. The original order of plates wasn't placed properly.